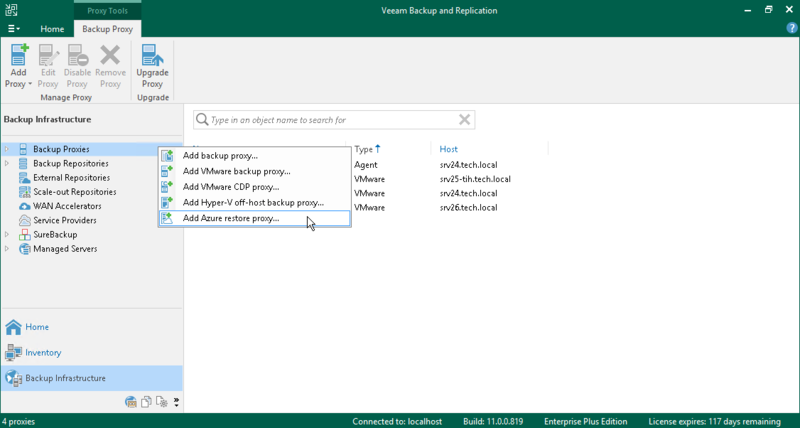 Open the Backup Infrastructure view. In the inventory pane, select Backup Proxies, click the Backup Proxy node, and click Add Proxy > Azure on the ribbon. Open the Backup Infrastructure view. In the inventory pane, right-click Backup Proxies and select Add Azure Proxy. Before you start to configure an Azure proxy, you must import information about the Microsoft Azure user account. In the opposite case, the Add Azure Proxy option will not be available. For more information, see Adding Azure Accounts or Adding Azure Stack Accounts.